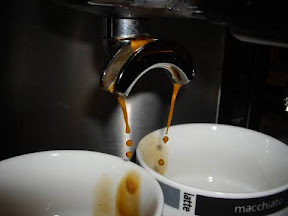 Here we prepare the espresso, which is the essence and base for any coffee drink whether it’s machiatto, cappucino, flat white or cafe latte. 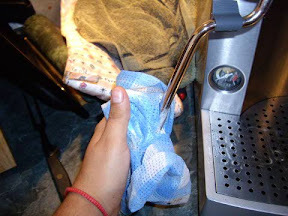 Some espresso machines have a hot water spout. 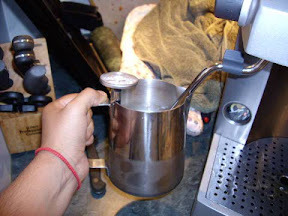 This can be used to pre-heat the cups before brewing the espresso to ensure that you get a hot drink without having to over-heat or even burn the milk. 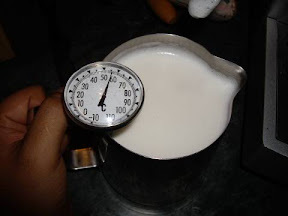 As you will see in Part II, I prefer to remove the milk around ten degrees under the norm for cafes as I think you get more sweetness, the only setback is that the end drink will be cooler than expected. 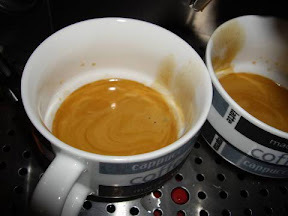 Turn on the espresso machine to warm up and pre-heat the cups by filling them with pre-boiled water. 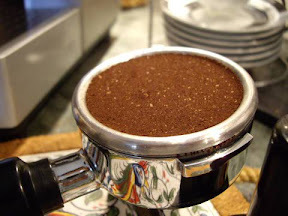 Grind the coffee directly into the basket of the portafilter. 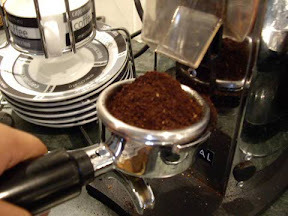 Tamp the coffee grinds to create a flat surface. Top up with more ground coffee. 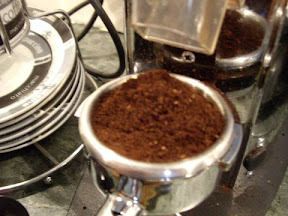 Tamp again and ensure the rim of the basket is clean and free of excess coffee grounds. 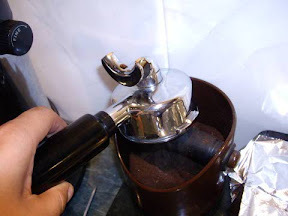 Position the portafilter into the grouphead and slide to the right of the arrow indicator. 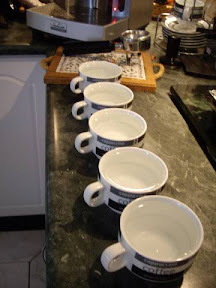 Empty the water-filled cups and place under the coffee spouts. 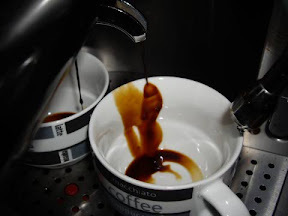 Now turn the machine on and watch attentively as the coffee is extracted to see whether it was a hit or a miss result. Resistance in the pour and visible crema is a good sign. 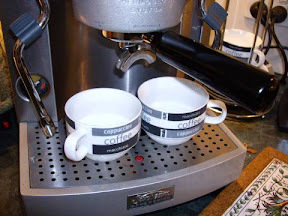 Stop the extraction once you have about 30mL of coffee in the cups. Place cups on warming plate located on top of the machine. Empty out brewed coffee remains into the waste container. 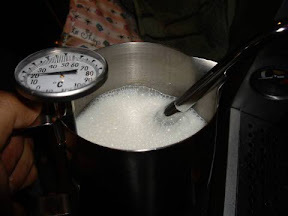 Now we look at frothing the milk to get a silky/velvety consistent texture ideal for cappucinos and lattes. 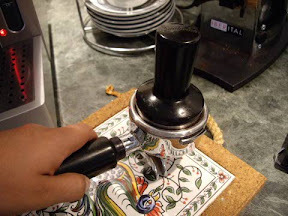 This is the most difficult part of espresso coffee making and it took months if not years for me to learn. Practise is the best and only way to master this step so be patient while you are learning. Add fresh milk to the pitcher until the beak. 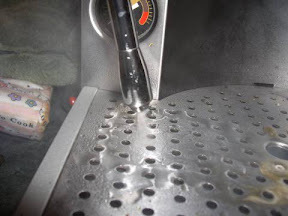 Now flush the steam wand into the collector drain before hand to remove any possible build up from before. This also prepares the wand for the next step by ensuring the pressure and heat are at their highest right before frothing. Hold the milk pitcher at a slight angle away from the wand. 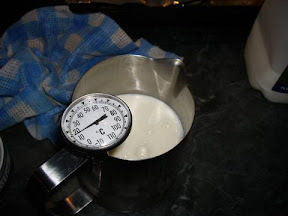 Only just immerse the wand tip into the milk, about 1cm or 1/2 and inch. 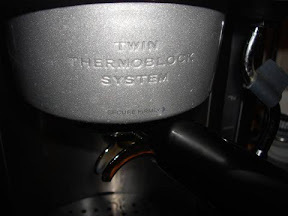 Turn on the steam wand, bubbles may form in the first 10 seconds. Nothing to worry about as they will soon get smoothed out. 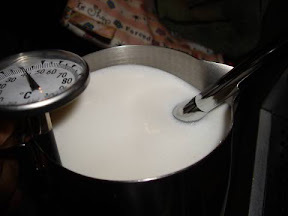 Keep the angle and the wand tip submerged in the milk at all times. Bubbles are now slowly disappearing. Once you place the milk pitcher aside, immediately wipe down the wand with a moist cloth and flush into the tray once again. It’s important to keep the steam wand clean at all times. 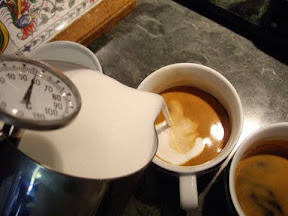 Now you will free pour the milk into the cup of coffee, piercing through the layer of crema and mixing both liquids together as the level rises. 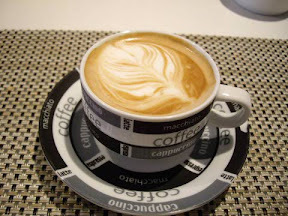 It’s good to see that the top layer of the finished cappucino has both brown and white colours visible as this indicates that the milk has mixed well with the crema, providing a consistent taste and texture throughout the beverage. 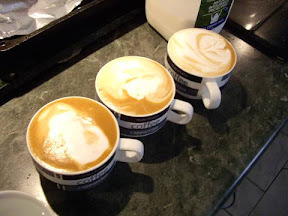 I’m no master of latte art but it’s good to constantly practise. 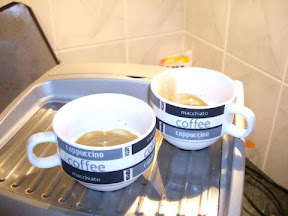 And that’s how I prepare espresso coffee at home. Please comment or add suggestions. 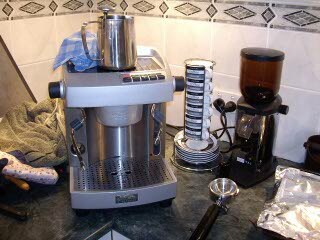 This entry was posted in Cooking and tagged cappucino, coffee, crema, espresso, flat white, froth, grinder, latte by Reinaldo (old posts). Bookmark the permalink. I found this page bookmarked and I really liked what I read. I will definately bookmark it too and go through the other posts tomorrow.